Just consider the following facts about America’s infrastructure from the Pew Research Center website…..
*According to the U.S. Department of Transportation, more than 25 percent of America’s nearly 600,000 bridges need significant repairs or are burdened with more traffic than they were designed to carry. *According to the Federal Highway Administration, approximately a third of America’s major roadways are in substandard condition – a significant factor in a third of the more than 43,000 traffic fatalities in the United States each year. *The Texas Transportation Institute estimates that traffic jams caused by insufficient infrastructure waste 4 billion hours of commuters’ time and nearly 3 billion gallons of gasoline a year. *The Association of State Dam Safety Officials has found that the number of dams in the United States that could fail has grown 134% since 1999 to 3,346, and more than 1,300 of those are considered “high-hazard” – meaning that their collapse would threaten lives. *More than a third of all dam failures or near failures since 1874 have happened in just the last decade. *According to the U.S. Environmental Protection Agency, aging sewer systems spill an estimated 1.26 trillion gallons of untreated sewage every single year, resulting in an estimated 50.6 billion dollars in cleanup costs. *A decaying transportation system costs our economy more than $78 billion annually in lost time and fuel. *The United States must invest $225 billion per year over the next 50 years to maintain and adequately enhance our surface transportation systems. Currently, we’re spending less than 40% of this amount. *U.S. transit systems earned a D+ rating from the American Society of Civil Engineers. Transit funding is declining even as transit use increases faster than any other mode of transportation – up 21% between 1993 and 2002. *Costs attributed to airline delays – due in large part to congestion and an antiquated air traffic control system – are expected to triple to $30 billion from 2000 to 2015. *By 2020, every major U.S. container port is projected to be handling at least double the volume it was designed to handle. *Throughout the United States, railroads are projected to need nearly $200 billion in investment over the next 20 years to accommodate freight increases. America’s aging infrastructure cannot handle the number of people that we have now. With the population of the United States expected to hit 420 million by 2050, there are serious questions about how the national infrastructure is going to hold up under such a strain. Already the infrastructure in many areas of the United States is beginning to resemble that of a third world nation. The video posted below contains some of the highlights from a History Channel special about America’s infrastructure from a couple of years ago that highlights many of these problems…. So can anything be done about America’s crumbling infrastructure? State and local governments can spend the money needed to fix and maintain our infrastructure. Because state and local governments are now facing unprecedented financial shortfalls. In fact, it is more likely that expenditures on infrastructure will actually be cut. 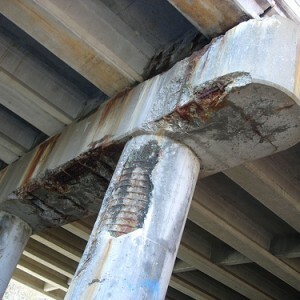 It means that America’s infrastructure will continue to rust, decay and fall to pieces. Our grandparents and great-grandparents invested a lot of time, energy and money into building up this great nation, but now we are letting it rot right in front of our eyes.